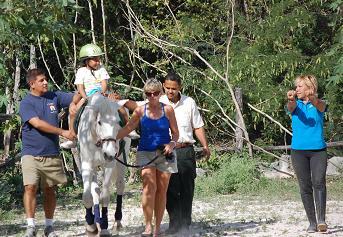 The Rancho Universo Equestrian and Horse Sanctuary located 11 kilometers east of San Miguel in Cozumel, provides equine therapy to people with disabilities. Owner and equine therapy specialist Liliana Velasco-Ariza works primarily with children up to the age of seven who may have cerebral palsy, Down syndrome, speech or cognitive impairments or other challenges. The therapy can also promote strengthening and toning of muscles, increase mobility, release pain and have other physical, psychological and emotional benefits. Liliana and William, her therapy horse, teamed up with Friends of Cozumel volunteers to offer therapy sessions at no cost to local children. 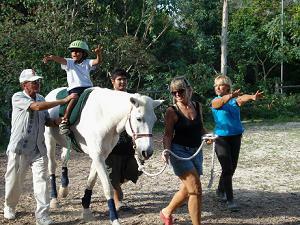 For each therapy session, three volunteers are needed to help stabilize the child and to lead the horse while Liliana instructs the child on positioning and movements. 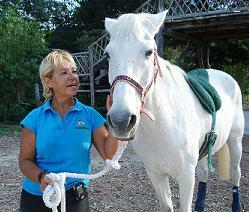 Prior to her nine years with the horse sanctuary in Cozumel, Liliana studied with the International Riding for the Disabled Association, the British Horse Society and the Asociación Mexicana de Equitación Terapéutica. Liliana recommends therapy sessions twice a week for six months to a year. It’s typically an expensive therapy, but Liliana donates her expertise and horses to reach as many children with disabilities as possible. 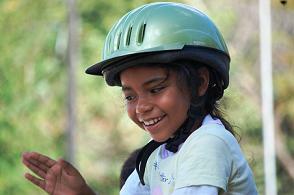 She would like more children to have the opportunity, and is willing to train the volunteers needed for the therapy. 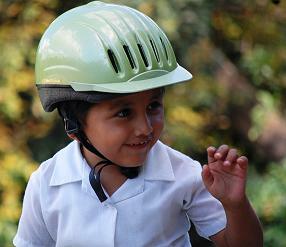 Supplies not available on the island are also needed for the therapy: safety helmets in child sizes, exercise bandages, hoof picks, saddle pads and lead ropes. I am a Social Worker in Canada and have spent the majority of my 25 year career working with children with emotional and behavioral difficulties, as well as cognitive impairment and developmental delays. I am very interested in learning more about Equine Therapy and had my first exposure to process last year during a stay at the Chopra Centre. I am a decent rider and had horses in my youth and am very comfortable around them. I will be travelling to the Yucatan this winter to visit a friend and have been looking for an opportunity to do some volunteer work over the winter. I am very, very interested in the opportunities your program offers and wonder how I would go about getting and giving more information to explore if I could be of service to your organization. I can’t tell you how excited I was to come across your program, to find all the elements and interests I am looking to pursue was a wonderful moment of serendipity.